« And The Rain Came! The Dogwoods Are Starting To Bloom! According to the weather forecast, we might be in for some weather later today and into tonight. Thunderstorms, possibly severe, especially this evening. This, in turn, will certainly cool down the 80 degree days we have be experiencing. We even have a freeze watch in effect from Monday evening through Tuesday morning! But, by Tuesday afternoon, we will be back into the upper 50s and mid to upper 60s through Friday. The weekend looks like 70s! Generation has been non-stop for the past seven days. Pretty much running the equivalent, of course plus or minus, of 2 units every day (100 mwh) So, we have seen the cfs vary from 8600 to 4400. Ahh……life in a tailwater! midge under the big ruby or a size 12 cerise San Juan worm. Paula, from Cleveland, MO. spent the first day of her two day’s fishing with Gina. They had a good couple days on the big ruby, black midge and blue poison tunghead. Stan and Carolyn had two couples from Wyoming out for half a day. Stan took the guys, Ed and Terry, and Carolyn had the ladies, Nancy and Denise. Stan’s guys are fly fishers and they had a really good day on the big ruby with the black midge dropper. One of Carolyn’s ladies, Nancy, is pretty new. After mastering the roll cast, she held her own on catching as did Denise. Fun couple of ladies to fish with. We hooked fish on the black midge under the big ruby and the cerise San Juan worm. Lots of “rodeo catches”! JP and Rich spent Friday on the water with Carolyn. The guys worked hard and finished up with a pretty good day. Fish were spotty, but when it dried up in one place, we’d move and the bit was on again. Hits were steady all morning. Best patterns were…..yep! the black midge under the big ruby or cerise San Juan worm. Stan had Jeff and Karen from Iowa out. They are both pretty new to fly fishing. Tough day for them with the heavy currents, but they certainly caught some fish and had a fun morning. Dana took Kurt and his wife Lynne out for their first half day of fishing with him. Kurt has been fly fishing for a few years and Lynne is just getting started. These two are from Texas. First day a little slower than the second, but they caught fish on the red midge and red San Juan worm Saturday, Phil and Kellie, from Kansas spent the morning with Darrell. Good day for these two on the CQ streamer, red midge and the P&P. 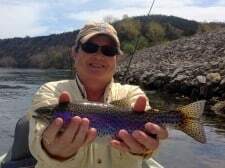 Kellie is new to fly fishing and just “wanted to catch one fish”. Well, after one fish, she wanted to catch another! Stan and Carolyn had two couples from Florida out all day. Stan had John and Claire and Carolyn took Dawn and Bill. Hoot of a day for everyone. All are pretty good fly flingers and we had a great day on the water. Same old, same old, big ruby with size 16 black midge and some stripping a holographic green crackleback. 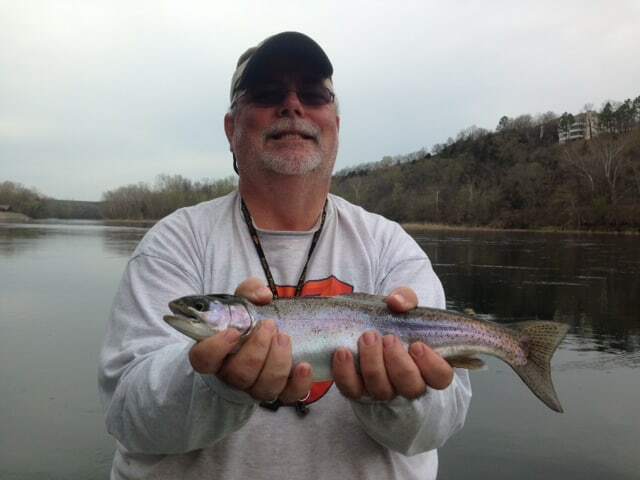 Bill’s bottom bug, the size 16 black midge caught enough fish he dubbed it “the magic fly” . Needless to say, he took that fly (unfortunately it had broken) home with him. The group had been fishing in Arkansas for two days before they fished with us so by 4:00 p.m., Claire said her arm had had it! Time for some R&R and a glass of wine! I like the way this lady thinks. 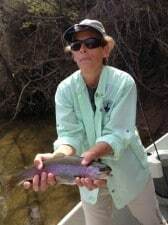 This entry was posted on Sunday, April 13th, 2014 at 12:30 pm	and is filed under Fishing Reports. You can follow any responses to this entry through the RSS 2.0 feed. You can leave a response, or trackback from your own site.